Exquisite style. 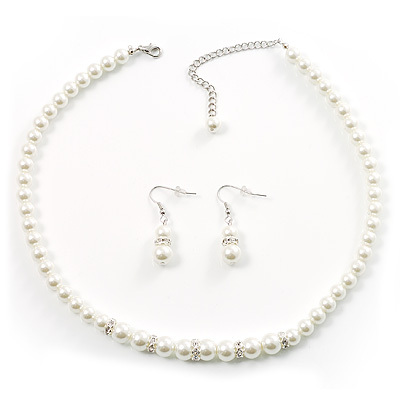 Add a sophisticated touch to any outfit with this crystal glass pearl necklace and drop earring set. Lustrous glass pearls offer classic beauty. Graduated (8mm, 10mm) design lends a unique look. Silver tone construction guarantees lasting shine. Lobster-claw clasp ensures a secure fit. Fishhook backings promise comfortable wear. Please note: This product is non-returnable. Returns: This product is non-returnable.